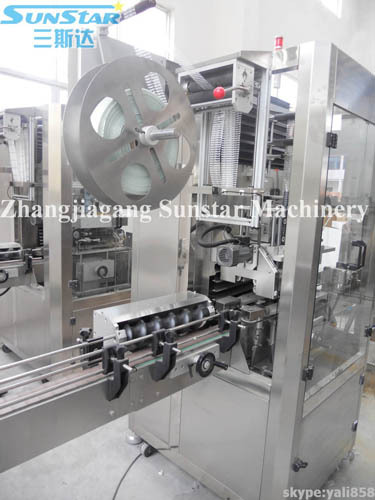 Bottle Mouth/Neck/Cap Sleeve labeling Machine---The sleeve labeling machine was used for sleeve the label onto bottle mouth, neck or bottle cap and shrink it by steam. The bottle neck/cap sleeve labeling machine is suitable for glass bottle neck and plastic bottle neck or cap. 1, the whole stainless steel structure: stainless steel SUS304, simple structure, good appearance, easy to clean, the whole machine is waterproof does not rust. 2, unique cutter system: adopting the static cyclotron cut way, labels, cutting a right, without flash, burr. 3, special label location positioning device: guarantee the accuracy of the set of standard processes label positioning. 4, adopts the modularization design, module control, precision, high speed of label. 5, using high quality touch screen operation section, the realization of finger operation, convenient and quick. 6, whole machine high degree of automation, simple to use, only one person operation, easy maintenance.